On Sunday the 5th of August, we will host our 11th Annual Vintage Festival. 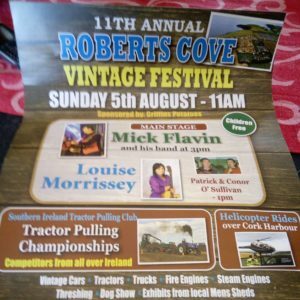 Once again the festival will take place in the scenic setting of Roberts Cove. We continue to expand our festival each year with new attractions. One of the main events is the tractor pulling competition. The Irish Tractor Pulling Association will hold Round of the all Ireland Tractor Pulling Competition at this year festival. Competitors from north and south will attend. The day will begin with the usual vintage car & tractor around the local area before returning to the festival field. Children’s Amusements including; pony rides, pet corner, bungee trampoline, bouncing castles, rodeo bull, Sumo wrestling and lots more! With more events to be confirmed, this year’s Festival will be our biggest yet. Over 3000 festival goers attended last year and we hope to continue to grow with your support!